After 15 years in the Royal navy, “Shep” Woolley is pinning his hopes for success in civilian life on the theme of draft-dodging. “Shep” who lives on Tamworth’s Perrycrofts Estate, will leave the service in a few weeks time and plans to become a professional country and folk singer. As a first step in his stage career he will appear on the television talent-spotting show “New Faces” tomorrow (Saturday). He says that if the song is well received he will probably record it as his first single. Last year he bought out an LP of country and folk entitled “Pipe Down” which has so far sold 2,000 copies. He first started singing to the accompaniment of his guitar when he was 13 and was later a member of the Wilnecote group The Dominoes and sang with Danny Coral and the Surfriders. Now he plans to tour the country with his act as soon as his naval service is over. 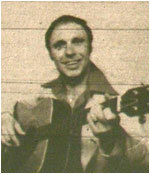 The full profile and history of Shep Woolley has yet to be added to TamworthBands.com Call back soon to read the full details.